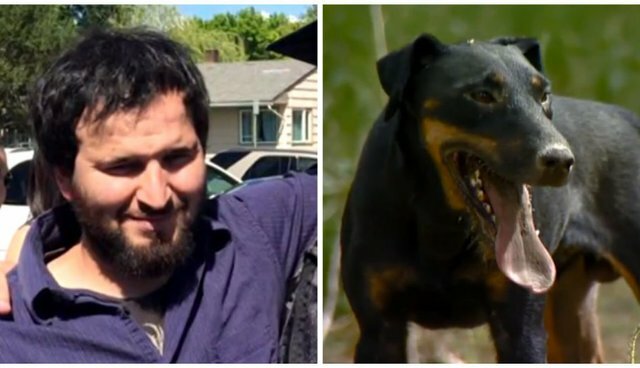 An Oregon family is mourning the loss of their son and brother - a man who was such an animal lover that he lost his life trying to rescue two puppies. Thirty-year-old Matthew Allen Johnson was found dead outside his Vale, Oregon, home on Sunday. He had been trying to save two of his puppies from a deep hole in his yard when the dirt collapsed on top of him. "If he thought any kind of animal or person was in trouble, he was going to do whatever he could to remove them from that trouble," local Sheriff Brian Wolfe, who knew Johnson personally, told KTVB. "I'm sure Mr. Johnson thought he could retrieve the pups and get out of the hole with no problem." The two puppies survived, and were reunited with their mom and three siblings. Johnson's family told KTVB that a friend will be adopting all seven of his dogs, though the puppies will eventually go to other homes. Johnson's death is sadly reminiscent of the story of Madhav Barve, who passed away earlier this month while protecting his beloved pet cat as a building collapsed on top of them. Both deaths were tragic accidents, but also a testament to the kind of men they were - willing to take a risk to save another life, even a small, furry one.